One of the things I noticed as I paged through my blog was the amount I wrote about my kids. I have no problem with that, since I they’re mine and most of my funny stories come from them these days. But I was trying to see my blog with objective eyes and I thought, “this dude writes about his kids a lot.” So I’m going to limit Hoppeland posts to the weekends. 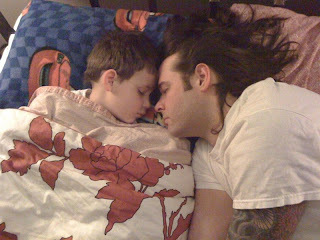 The other day Shannon posted this picture of Asher and I on Facebook. I think it’s awesome. (She told me later she made sure to get my ink in it. My wife, folks.) Asher is like a bear cub. He likes to be touching someone when he falls asleep. One day he’s going to be grown up and not want to do it anymore, so I’ll take it while I can get it. Shannon comes in from putting Asher in bed as I’m folding clothes and tells me he has a fever of 101. Then she tells me he wants me to come lie down with him. My son with the fever wants me to come lie forehead to forehead with him. Basically, he wants to breathe in my face. With a fever. As a parent, there’s nothing you won’t do for your kid. I’ve been thrown up, pooped and peed on. I’ve allowed them to place chewed food in my mouth. I’ve even given them the last bite of my ice cream, my cereal, my chocolate. But I had a really hard time with this one. Those other things were all “in the moment” types of decisions. But essentially, this would be me willingly lying down in the path of a bullet train. A bullet train called “Flu.” And just so he would go to sleep faster. No emergency. I really battled it. Even as he placed his hot little forehead against mine and breathed all over my face, I fought it. There’s nothing you won’t do for your kid. And I haven’t gotten sick.